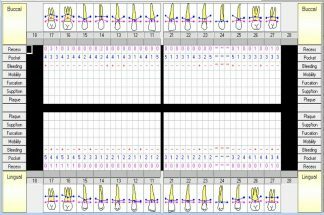 This is a detailed examination performed to assess and manage periodontal disease, by recording a patient’s periodontal condition. The chart records of number of aspects important to diagnosing the patient’s periodontal health. The periodontium is the attachment of the gum (gingiva) to the bone and to the teeth. The other part of the periodontal structure is the attachment of the tooth to the bone called the periodontal ligament. So let’s explain some terms. Recession – this is the loss of bone and gum that can be seen. The gum, bone and periodontal ligament should cover the root of the tooth to just below where the enamel layer finishes and the root begins. There is a healthy gingival sulcus (natural trough or gap) of up to 3mm between the tooth and gum at this area all around the tooth. Ideally there should be NO recession. 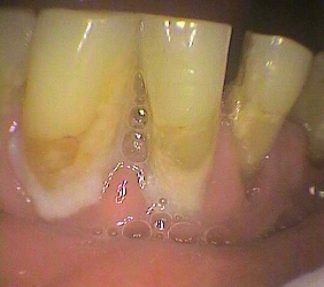 However past gum disease, decay, over brushing can cause this to happen. It means less support for the tooth to stay in your head! The exposed root can lead to sensitivity and is more prone to decay. Pocket – this is the depth of the space from the top of the gum to the base of the space between the gum and the tooth i.e. the sulcus. Ideally it should be no more than 3mm. However, if the gum is swollen then it can give reading that may be misleading. Ideally this measurement should be done once a clean of the teeth has been done. This may require a second visit if there is a lot of cleaning to do. There is a special probe called a periodontal probe that has millimetre markings. By using LIGHT contact a measurement can be attained. Further charting will enable a progress of treatment with the aim to reduce the pocket to a healthy depth of 3mm without bleeding. Bleeding – This is a rough indicator of the degree of in inflammation in the gums in forming the pocket. It ranges from nil, +,++,+++, i.e. none, mild, moderate, severe. Inflammation can be modified by the general health of the body and anything that can modify the immune system such as hormones and medications. By using a periodontal probe lightly in the gum sulcus, the reaction of the gum by bleeding can be assessed. Nil is ideal! Upper Teeth - Periodontal Charting Probe with millimetre markings to measure gum pocket depth	 Recession exposing the root and germs over the gum forming a pocket - not good!